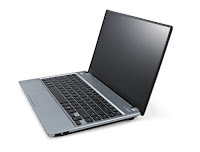 LG Blade P430 and P530 Ultra-Slim notebooks are powered by 2nd generation Intel Core i7/i5/i3 processor. The memory suppports up to 8GB. LG Blade P430 and P530 have super-slim LED SCD screen, bezel and body. The display size of P430 is 14 inch and P530 is 15. inch. LG Blade notebook has bezels that are more than 40 percent narrower than other notebooks. The bezel width is only 10 mm. Blade P430 has a thickness of 23.8 mm and weight 1.94 kg, while the P530 weight is 2.2 kg. There are two colors available for these laptops, Misty Blue and Titan Black. P430 and P530 are designed with a metallic case. Both are equipped with 1.3 Mega Pixel HD webcam, 6-cell Lithium-Ion battery, HD Audio, SRS Sound, Bleutooth 3.0 with HS, WLAN Wi-fi 802.11 b/g/n. Gigabit LAN, a HDMI port, a VGA port, internal microphone, three USB 2.0 ports, headphone out, microphone in, RJ45, and 5-in-1 card reader which supports for SD/SDHC, MMC, SD, MS/MS Pro, and xD.